I found a great tutorial, actually several, on joining as you go. So I decided to start working the black border and doing just that. So far so good. I love how the black offsets the pretty colors and textures of the different yarns I’m working into the squares. My original idea of 8 squares across and 12 squares lengthwise seems like it’ll be a good size especially once I factor in the border. It is already getting covered in cat hair. But then, that’s not shocking. We do have one or two of them about. 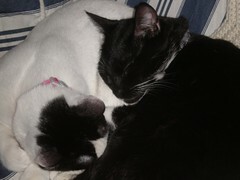 This entry was posted in cats, Strings, Sticks and Wheels. Bookmark the permalink. 4 Responses to Granny mania! 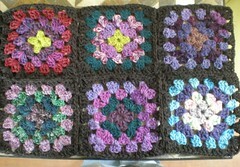 I love the black edging on the squares. It makes the colors pop. 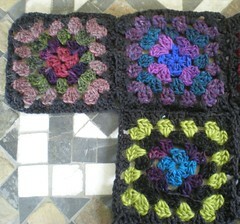 Love it – traditional granny afghan in the works! EVERYTHING I knit is at least 10% cat hair. The will insist upon supervising. Looking fantastic! Like stained glass! I’m now inspired to unify my granny squares with a border. Will try to post photos this weekend.